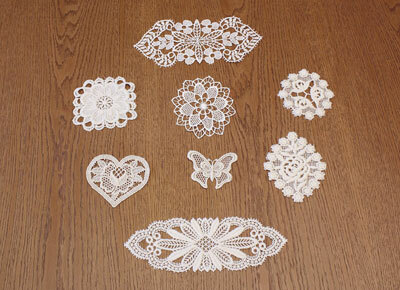 Lace doilies "Collection Clara" A nice collection of differents shapes available in ecru or white. 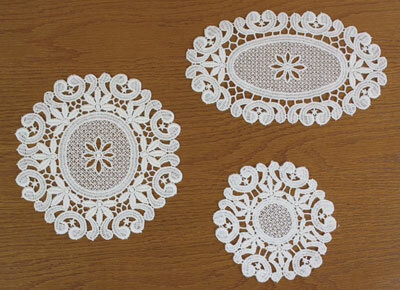 Lace doilies "Tradition" A nice collection of 3 diamond shapes available in ecru or white. 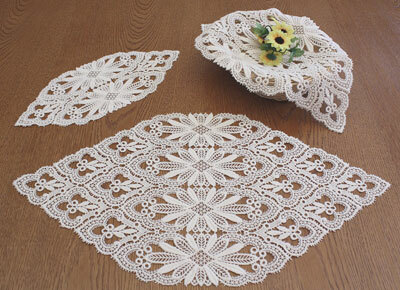 Lace doilies "Grand Tradition" Big round doilies available in 3 sizes : 18, 24 and 36 inches diameter in ecru or white. 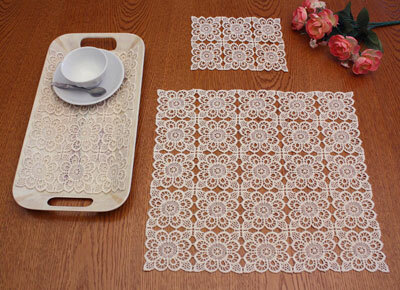 rectangular Lace doily "Cathy" Manificient rectangular lace doily available in 12 X 32 or 12 X 21 inches in natural or white. 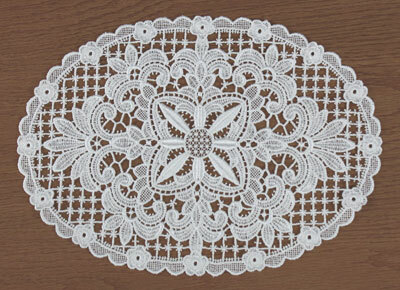 Round Lace doily "Marie" A nice round lace doily of 12 inches diameter available in natural color or white. 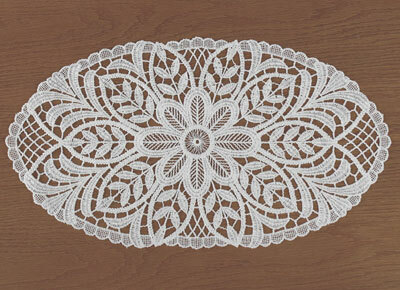 Oval Lace doily "Anna" A nice oval lace doily in 20 X 11 inches available in natural color or white. 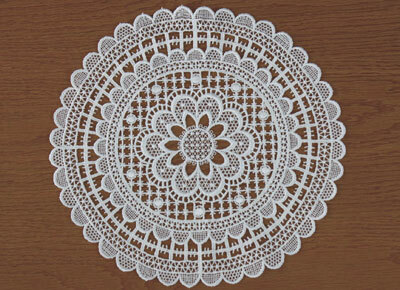 Big round Lace doilies "Cathy rond" Big round doily of 16 inches diameter available in natural color or white. 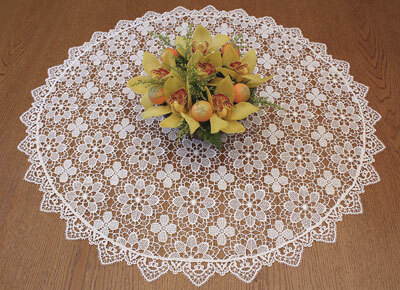 Oval Lace doily "Helenne" Oval lace doily available in 13 X 9 inches available in natural color or white. 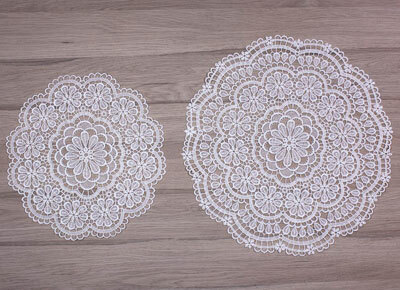 Lace doilies "Collection Emilie" A pretty collection of round and oval doilies available in ecru and white. 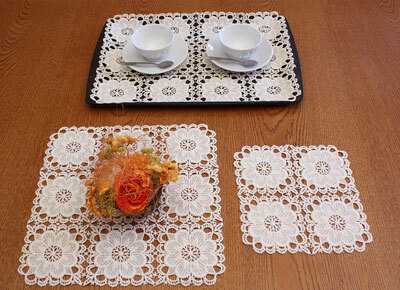 Lace doilies "Collection Chambord" Collection of square and rectangular doilies available in custom size in ecru and white. 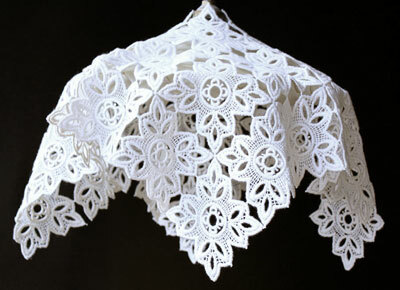 Lace Lamp shade "Abat-jour" A touch of charm in your home with this lace lamp shade available in ecru or white. 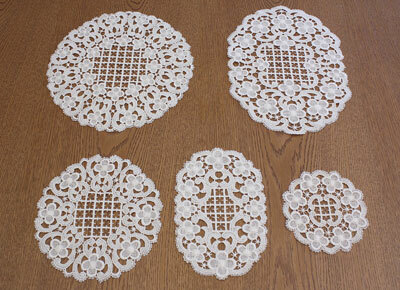 Lace doilies "Collection Tradition" Doilies avaialable in 3 wide : 14, 18 and 22.4 inches, custom length in ecru or white. 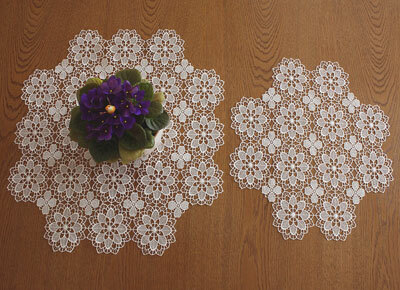 Lace doily "Collection Flora" A gorgeous collection of round and oval doilies available in ecru in tulle or fabric. 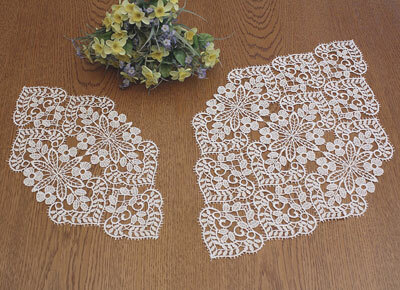 Lace doilies "Valentine" Original shapes available in 2 sizes in natural color or white. 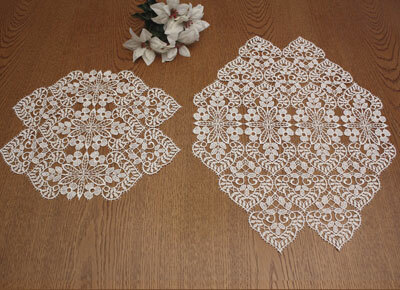 Lace doilies "Collection Valentine" Original shapes available in 14.8 and 20 inches wide, cutsom lenth in natural or white. 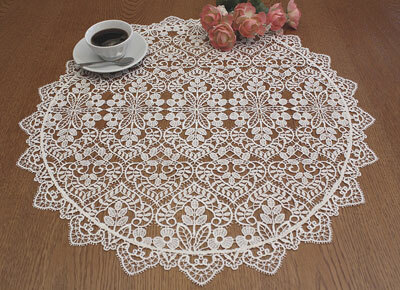 Lace doilies "Grand Valentine" Big round doilies available in 3 sizes : 16, 24 and 34 inches diameter in ecru or white. 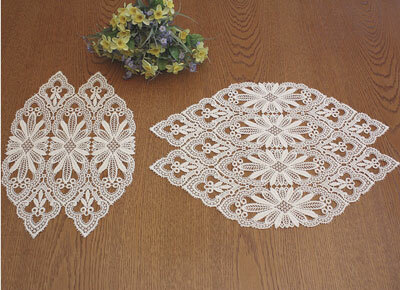 Lace doilies "Collection Classic" Collection of oval doilies in 16 inches width available in ecru or white. Custom length. 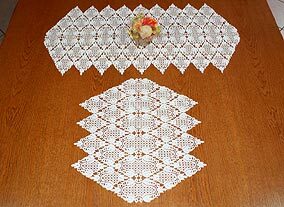 Lace doilies "Sandra" Fine french lace doilies available in natural color in 16 inches wide, custom lenght. 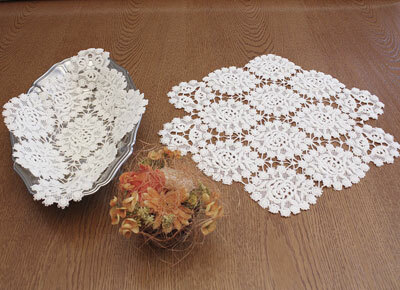 Lace doilies "Motifs" A nice and original collection of small doilies in different shapes in ecru or white. 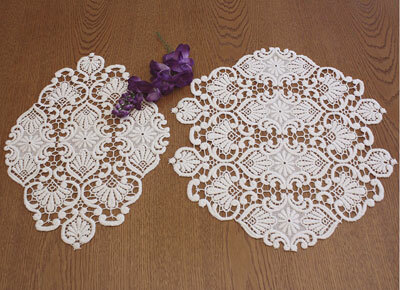 Lace doilies "Collection Amaryllis" Big original fine doilies avaialble in custom length in 18 and 22.4 inches wide in natural or white. 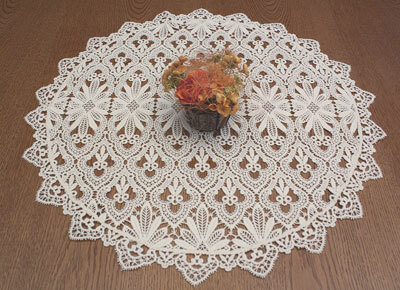 Lace doilies "Grand Amaryllis" Big round doily available in 32 inches diameter in natural or white. 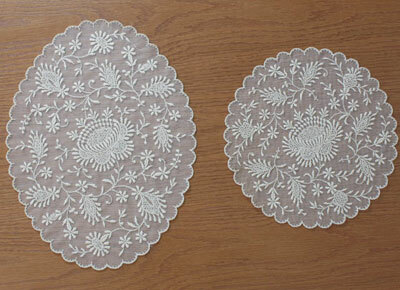 Lace doilies "Collection Petites Roses" Collection of oval doilies in 16 inches width available in ecru or white. Custom length. 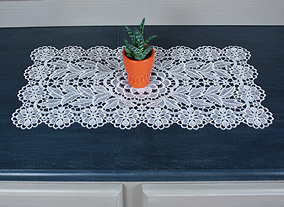 Lace doilies "Collection Catherine" Collection of square and rectangular doilies available in custom size in ecru and white. 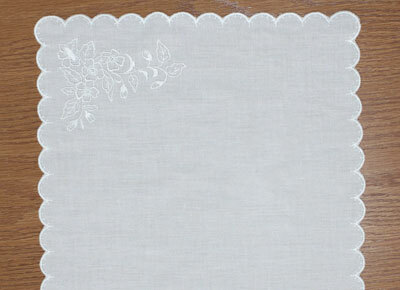 Fancy handkerchiefs White embroidered fancy handkerchief available in 10 X 10 inches.